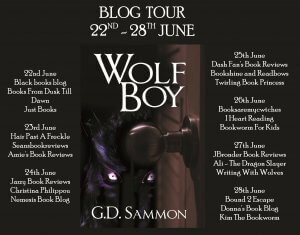 Delighted to be invited to take part in the blog tour for Wolf Boy today by G.D Sammon. I actually really enjoy getting a book for Ollie to review as it means that we read it together getting some great quality reading time together and also, it means that I get to read a genre that I wouldn’t normally read but do actually really enjoy. And this was one such book. A brilliantly written fantasy adventure which follows Connor’s life after the mysterious death of his father and the onset of blindness. However, he can see in his mind and the incredibly vivid descriptions make the world in his wardrobe come alive and really captivated Ollie. It’s a gripping, really well paced read, aimed I believe at 10-14 year olds but I blooming loved it too and it was so full of action that it kept us interested and we couldn’t wait to read more. Connor was such an awesome character that Ollie really enjoyed reading about. He had lots of obstacles to overcome, with grief, a house move and going along to therapy as well as blindness and was a really interesting fella to read. 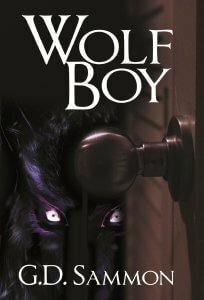 We thoroughly enjoyed reading Wolf Boy and would definitely look out for more by this author. Because Connor had been struck blind by the shock, yet somehow he could still see – with his mind. Connor had experienced a series of waking nightmares in his room. Creatures battled under his bed at night, and the yellow glowing eyes of a wolf glared at him from his wardrobe doors. One night Connor decided to investigate the wolf in the wardrobe, taking him on a fantastic adventure to a world dominated by wolf people, in constant battle with hideous forest creatures led by a cruel human. Gerry Sammon is a journalist and former newspaper editor based in Bolton, Lancashire. 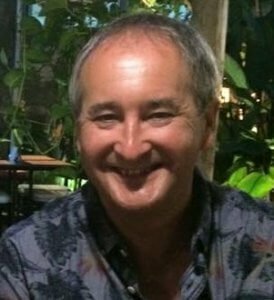 From September 2015 he has been a tutor in Media Law at News Associates in Manchester, an award-winning private training provider, tutoring trainee journalists in media law and ethics. He also teaches media law to students at Manchester Metropolitan University, and at the University of Central Lancashire based in Preston. He has travelled widely, both for business and on family holidays. The idea for Wolf Boy came from a dream my daughters used to have when they were small children. The elder daughter would dream there was a wolf in the wardrobe (this is how our adventure begins in Wolf Boy), and my youngest daughter had a dream that a crocodile lived under her bed.